For the wider London borough, see City of Westminster. For other uses, see Westminster (disambiguation). Westminster is an area in central London within the City of Westminster, part of the West End, on the north bank of the River Thames. Westminster's concentration of visitor attractions and historic landmarks, one of the highest in London, includes the Palace of Westminster, Buckingham Palace, Westminster Abbey and Westminster Cathedral. The name Westminster (Old English: Westmynstre) originated from the informal description of the abbey church and royal peculiar of St Peter's (Westminster Abbey), literally West of the City of London (indeed, until the Reformation there was a reference to the 'East Minster' at Minories (Holy Trinity Priory, Aldgate) east of the City). The abbey was part of the royal palace that had been created here by Edward the Confessor. It has been the home of the permanent institutions of England's government continuously since about 1200 (High Middle Ages' Plantagenet times), and from 1707 the British Government — formally titled Her Majesty's Government. In a government context, Westminster often refers to the Parliament of the United Kingdom, located in the UNESCO World Heritage Palace of Westminster — also known as the Houses of Parliament. The closest tube stations are Westminster and St James's Park, on the Jubilee, Circle, and District lines. The area is the centre of Her Majesty's Government, with Parliament in the Palace of Westminster and most of the major Government ministries known as Whitehall, itself the site of the royal palace that replaced that at Westminster. Within the area is Westminster School, a major public school which grew out of the Abbey, and the University of Westminster, attended by over 20,000 students. Bounding Westminster to the north is Green Park, a Royal Park of London. The name describes an area no more than 1 mile (1.6 km) from Westminster Abbey and the Palace of Westminster immediately to the west of the River Thames. The settlement grew up around the palace and abbey, as a service area for them. The need for a parish church, St Margaret's Westminster for the servants of the palace and of the abbey who could not worship there indicates that it had a population as large as that of a small village. It became larger and in the Georgian period became connected through urban ribbon development with the City along the Strand. It did not become a viable local government unit created as a civil parish. Henry VIII's Reformation in the early 16th century abolished the Abbey and established a Cathedral - thus the parish ranked as a "City", although it was only a fraction of the size of the City of London and the Borough of Southwark at that time. Indeed, the Cathedral and diocesan status of the church lasted only from 1539 to 1556, but the "city" status remained for a mere parish within Middlesex. As such it is first known to have had two Members of Parliament in 1545 as a new Parliamentary Borough, centuries after the City of London and Southwark were enfranchised. The former Thorney Island, the site of Westminster Abbey, formed the historic core of Westminster. The abbey became the traditional venue of the coronations of the kings and queens of England from that of Harold Godwinson (1066) onwards. From about 1200 the Palace of Westminster, near the abbey, became the principal royal residence, a transition marked by the transfer of royal treasury and financial records to Westminster from Winchester. Later the palace housed the developing Parliament and England's law courts. Thus London developed two focal points: the City of London (financial/economic) and Westminster (political and cultural). The monarchs moved their principal residence to the Palace of Whitehall (1530-1698), then to St James's Palace in 1698, and eventually to Buckingham Palace and other palaces after 1762. The main law courts moved to the Royal Courts of Justice in the late-19th century. Part of Charles Booth's poverty map showing Westminster in 1889. The streets are coloured to represent the economic class of the residents: Yellow ("Upper-middle and Upper classes, Wealthy"), red ("Lower middle class – Well-to-do middle class"), pink ("Fairly comfortable good ordinary earnings"), blue ("Intermittent or casual earnings"), and black ("lowest class ... occasional labourers, street sellers, loafers, criminals and semi-criminals"). Booth coloured Victoria Street, with its new shops and flats, yellow. The model dwellings built by the Peabody Trust on the sidestreets off Victoria Street were coloured pink and grey, signalling modest respectability, while the black and blue streets were the remaining slum areas housing the poorest. 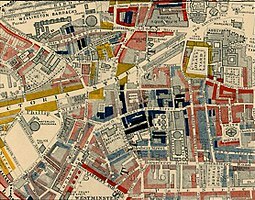 Charles Booth's poverty map showing Westminster in 1889 recorded the full range of income and capital brackets living in adjacent streets within the area; its central western area had become (by 1850) (the) Devil's Acre in the southern flood channel ravine of the Tyburn (stream), yet along Victoria Street and other small streets and squares had the highest colouring of social class in London, yellow/gold. Westminster has shed the abject poverty with the clearance of this slum and with drainage improvement, but there is a typical Central London property distinction within the area which is very acute, epitomised by grandiose 21st-century developments, architectural high-point listed buildings and nearby social housing (mostly non-council housing) buildings of the Peabody Trust founded by philanthropist George Peabody. 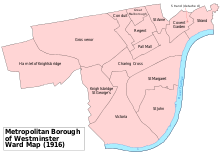 The Westminster area formed part of the City and Liberty of Westminster in Middlesex. The ancient parish was St Margaret; after 1727 this became the civil parish of 'St Margaret and St John', the latter a new church required for the increasing population. The area around Westminster Abbey formed the extra-parochial Close of the Collegiate Church of St Peter surrounded by — but not part of — either parish. [clarification needed][surrounded by both parishes?] Until 1900 the local authority was the combined vestry of St Margaret and St John (also known as the Westminster District Board of Works from 1855 to 1887), which was based at Westminster City Hall in Caxton Street from 1883. The Liberty of Westminster, governed by the Westminster Court of Burgesses, also included St Martin in the Fields and several other parishes and places. Westminster had its own quarter sessions, but the Middlesex sessions also had jurisdiction. 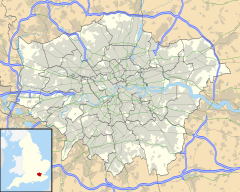 The area was transferred from Middlesex to the County of London in 1889, and the local government of Westminster was reformed in 1900, when the court of burgesses and the parish vestries were abolished, and replaced by a metropolitan borough council. The borough was given[when?] city status, allowing it to be known as the City of Westminster and its council as Westminster City Council— a title which was retained when it was merged with the boroughs of St Marylebone and Paddington in the 1960. Thus "Westminster", with its focus in public life from early history, is casually used as a metonym for Parliament and the political community of the United Kingdom generally. (The civil service is similarly referred to by the northern sub-neighbourhood it inhabits, "Whitehall".) "Westminster" is consequently also used in reference to the Westminster system, the parliamentary model of democratic government that has evolved in the United Kingdom and for those other nations, particularly in the Commonwealth of Nations and other parts of the former British Empire that adopted it. 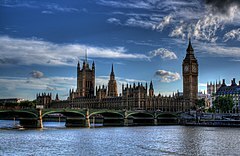 The term "Westminster Village", sometimes used in the context of British politics, does not refer to a geographical area at all; employed especially in the phrase "Westminster Village gossip", it denotes a supposedly close social circle of members of parliament, political journalists, so-called spin doctors and others connected to events in the Palace of Westminster and Government ministries. ^ "London's Places" (PDF). London Plan. Greater London Authority. 2011. p. 46. Retrieved 27 May 2014. ^ Richard, Dennis (2008). Cities in Modernity: Representations and Productions of Metropolitan Space. Cambridge University Press. p. 140. ISBN 978-0-521-46841-1. Wikivoyage has a travel guide for Westminster.